Royal Challengers Bangalore's (RCB) losing streak continues in the Indian Premier League 2019 (IPL 2019). The Virat Kohli-led side lost to Kolkata Knight Riders (KKR) in front of the home crowd at the M Chinnaswamy Stadium in Bengaluru. RCB have now played five matches and in all these matches have met disappointment. 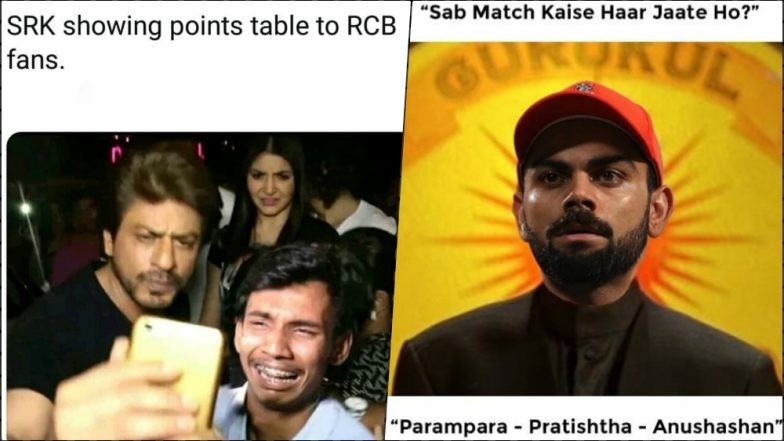 As RCB’s losing streak extends, memes trolling the franchise have started going viral on social media sites. Just like after every loss, fans took to Twitter and Instagram to post memes trolling RCB following the defeat against KKR. RCB vs KKR Highlights IPL 2019: Andre Russell Hands Royal Challengers Bangalore 5th Consecutive Defeat. Royal Challengers lost their first match against defending champions Chennai Super Kings. The Kohli led side then faced defeats against Mumbai Indians, Sunrisers Hyderabad, Rajasthan Royals and now Knight Riders. Meanwhile, following RCB’s loss against Knight Riders, funny memes have started doing rounds again! Enough of Funny RCB Memes! An Open Letter to Virat Kohli Haters From Royal Challengers Bangalore Fan. PIC 1: RCB fans when 80 runs was needed off 30 balls. RCB fans : We will win this match , Kohli has made comeback. RCB campaign is on a disappointing streak. Despite boasting of Virat Kohli and AB de Villiers in its squad, Royal Challengers Bangalore have failed to live upto the expectation. The Bengaluru-based franchise is under pressure to open their account on the IPL 2019 points table and are placed last on the team standings. Virat Kohli Misses Century in RCB vs KKR IPL 2019 Clash, But Overtakes Suresh Raina to Become Highest Run Scorer in Indian Premier League. It was Andre Russell's unbeaten 48 off just 13 balls that took the game away from RCB. Knight Riders chased down 206 runs with five wickets and five balls to spare. While it was fifth consecutive defeat for RCB, for KKR it was third win in IPL 2019.